I forgot to post yesterday's review last night so you get two reviews today. Crimson is another red made by Robert Oster. I purchased my ink from Vanness Pens. Crimson is a dusky, muted red. In ink drops the ink looks a bit brown when pooled, but doesn't actually show sheen. Other properties: Medium shading, no sheen, no shimmer. On 20 pound copy there was a little bit of bleeding in the flex nib and some feathering as well. Ink swabs for comparison, left to right (top to bottom for mobile RSS): Robert Oster Royal Red, Robert Oster Crimson, and Robert Oster Lipstick Red. Click here to see the Robert Oster inks together. 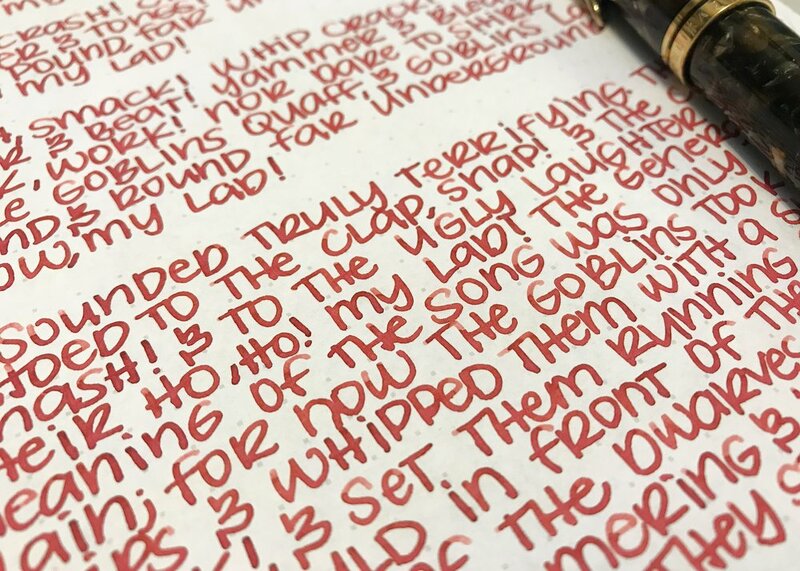 Robert Oster Rubine, Sailor Jentle Grenade, and Robert Oster Clay Red. Click here to see the red inks together. Overall, the ink is well behaved but I'm not crazy about the dusky color. I prefer my reds to be more vibrant. If you like the color give it a shot because it is pretty well behaved.